It is very important to notify the owner of the vehicle if you are planning on taking the vehicle abroad. If a vehicle is taken out of the UK without permission, it could result in alarming circumstances. Failure to provide evidence that the owner has granted you permission, could result in a fine or the vehicle could be impounded. The BVRLA reported that one driver was stuck at the border for 4 days until he was finally cleared to proceed. What Do You Need To Take A Vehicle Abroad? A VE103B form is the only valid documentation for taking a vehicle to a European state. If you are planning on shipping a vehicle outside of Europe, contact us for details of how to do this legally. Albania, Andorra, Austria, Belarus, Belgium, Bosnia and Herzegovina, Bulgaria, Croatia, Czech Republic, Republic of Cyprus, Denmark, Estonia, Finland, France, Gibraltar, Germany, Greece, Guernsey, Hungary, Iceland, Republic of Ireland, Isle of Man, Italy, Jersey, Latvia, Liechtenstein, Lithuania, Luxembourg, Macedonia, Malta, Moldova, Montenegro, Netherlands, Norway, Poland, Portugal, Romania, Russian Federation, Serbia, Slovakia, Slovenia, Spain, Sweden, Switzerland, Turkey, Ukraine. 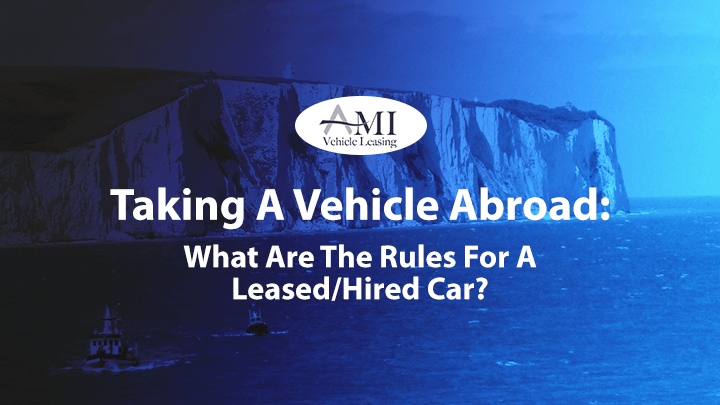 When you lease with AMI, we can issue all the documentation you need to take your vehicle abroad. We require a minimum of 5 full working days’ notice and a £25 (+VAT) admin fee. It is advisable you to request your VE103 and letter of authorisation at least 14 days before you wish to travel. The certificate is valid for 12 months from the date of issue. You will also need to make yourself familiar with any local driving laws and customs. You will also be required to insure you have adequate breakdown cover and you insurance policy allows for your vehicle to be repatriated to the UK if required. AMI vehicle leasing will not be liable for any cost incurred.